In Mark 1:15, Jesus says,”..repent and believe in the Gospel.” Often we hear people say that Jesus is the Gospel, but if that were true why wouldn’t Christ just have said “Repent and believe in me.” Was He just being humble or playing coy? The gospel that Jesus preached is the Kingdom of God. Cool, right? The book of Mark even begins by stating that it is “the begininning of the Gospel of Jesus Christ,” meaning the gospel Jesus preached–the Kingdom of God. So if Jesus preached the gospel of the Kingdom of God, what is it? Where is it? How do we find it? Many of you touched on the idea in yesterday’s post comments, in fact. George Eldon, author of The Gospel of the Kingdom, does an excellent job of communicating the idea of the Kingdom of God being both in the now and the not yet. Put simply, Eldon says that the Kingdom of God is the redemptive work of God, active and present throughout history, to bring defeat to his enemies and bring glory to men through His divine reign. In other words, the Kingdom of God is the rule and reign of God, both now and that which is to come. It is present because Jesus told us. ““If I cast out demons, then the kingdom of God has come upon you” (Matthew 12:28). But, it is also that which is to come, when in 1 Corinthians 15:50-51, Paul writes, “Now this I say, brethren, that flesh and blood cannot inherit the kingdom of God.” If flesh and blood cannot inherit the kingdom then the fullness of the kingdom is still to come–when our bodies are made glorified with Christ in heaven. …And, as Paul states, therein lies the mystery of the Kingdom. Because we know that the Kingdom is upon us, but we also know that men can reject it. We know that the Kingdom of God is the gospel Jesus Himself preached and yet we are not able to experience it fully…not yet. When Jesus told us to “…seek first the kingdom of God and his righteousness,” how are we able to do so unless we understand what it is we are to be seeking? We must seek the rule and reign of God. Which is why when we read the Lord’s prayer, we read that Jesus said “Your kingdom come, your will be done, on earth as it is in heaven.” Your rule and reign Father, both now–on earth–and as it shall be–in heaven. We must not pray this as simply a nicety, or Christian-ese, or rote routine. We must pray those words, as Jesus did, seeking the kingdom. And it is the gospel of the kingdom of God that we too must preach, the very gospel Jesus shared. For that is our call. “The gospel of the kingdom shall be preached in all the world for a witness unto all the nations; and then the end shall come” (Matthew 24:14). How have you experienced the rule and reign of Christ? Are you seeking the kingdom of God now or waiting for that which is to come? What else would you add to this discussion? 1. the kingdom of God signifies a return to eden of sorts, a complete and total restoration of relationship between God and mankind. some would argue this complete restoration occurs at salvation, but the word salvation is used in three distinct and different ways in the new testament, one of them being future tense (for Christians); we’ll call that one glorification. so, as you — and many yesterday — suggested, the kingdom is both “already and not yet.” our salvation is seen in the same way. 2. i’m also really excited you pointed out that the gospel / good news IS the kingdom of God. far too many define the gospel as Jesus’ death, burial, and resurrection (all extremely good things). but Jesus’ purpose was so much bigger than dying in order for my sins to be forgiven. his death ushered in a new kingdom. and we, like him, can only enter into that kingdom through our own deaths. 3. it’s so important that we understand Jesus’ preaching the good news of the kingdom was always accompanied by service and ministry. it is this service and ministry that gives non-christians a little taste of the kingdom (the already portion). i believe evangelism is intended to function not primarily (or at all) through programs, events, and even bible studies, but through the announcement — AND demonstration — of the kingdom to those being drawn by the Spirit of God. Perfect. That was a concise and completely appropriate quote, leaving no room to our imaginations/theologies. It would look great on my refrigerator. Seeking first The Kingdom says it all. In my private prayer life, The Kingdom of our Father is where I make my petitions and where I sing my praises, bowing low in surrender and submission. Everything else is merely window-dressing. 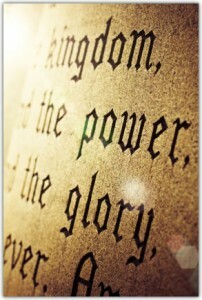 The kingdom of God is the place where God is king. When I lay down my (supposed) rights to obey His will, rather than choosing to follow my own desires, then I am walking in His kingdom. If He is truly my king, then His decrees are my daily marching orders which I joyfully and faithfully carry out. I have been granted citizenship in His kingdom because I decided to bow my knee and my will to Jesus as Lord of my life. Those who give their lives to him in this life already have their passports in order to enter the eternal kingdom in the next life. Those who refuse Him here are daily making their own choices to be apart from His rule and reign in His kingdom, and will continue to be excluded on that day when they will see the entrance to the glorious heavenly kingdom before their eyes. That’s why they will weep and gnash their teeth. The folly of their rejection of Jesus will finally be obvious to them. Those who love Him seek first to listen for, understand, and obey His orders every day, and choose to walk in His righteousness (Matt 6:33) as we follow His example and instructions. God gives His kingdom citizens good works to do (Eph 2:10) in order to bring His blessings into the world. He sends us as ambassadors of His kingdom (2 Cor 5:20) to invite others to enter into a reconciled relationship with the King. In His kingdom, here and now, His will is done. He accomplishes most of His work on this earth by giving assignments to His subjects, who respond in obedience. He does not command those who are not His. He sends us to meet the needs of our brethren first, and then to meet the needs of the others around us who need to see His love demonstrated in tangible ways. We who name Jesus as our Lord and Savior should be clearly demonstrating His life, His priorities, His holiness, His love and grace to all whom we encounter. Not just because of obligation (though we do have a debt that cannot be repaid), but out of a genuine love for our Lord and Master. My life is not my own. I have been bought with the high price of the blood of my King who loved me and laid down His life for me. You stated my heart and mind on this. Seeking the kingdom of God is what drives my blogging. One of the major opposing “kingdoms” trying to reign over all people including the church is the kingdom of sexual immorality. I see that as being one of, if not the most, powerful reasons why the spread of the Gospel is hindered in our country and in the world. What compels me to write is the desire to be used by God to tear down that kingdom and build His up. Thanks for this series! It’s great to think about and examine myself to see if I am really seeking Him in a way that is pleasing to Him.